South Korea's LG Group has announced plans to increase investment, in an attempt to boost its market share amid strong competition. The firm said it would invest 20tn won ($19bn; £12bn) in various subsidiaries, including LG Electronics, in 2013. The investment will be used to boost production facilities and fund research and development of products. 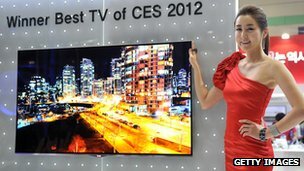 LG, one of South Korea's biggest groups, is facing increased competition from rivals like Samsung. Almost two-thirds of the investment will be allocated to increase production facilities at the group's electronics businesses. This will include expanding production lines to manufacture ultra-high resolution liquid crystal display (LCD) and organic light emitting diode (OELD) display panels. The firm said that its research and development investment would focus on developing smartphone software and next generation flexible and transparent display panels. According to some sources, the 20tn won annual investment is the highest announced by the group. LG did not immediately respond to the BBC's request to confirm that is the case.